Chile Says It's Possible That Poet Pablo Neruda Was Murdered : The Two-Way Neruda's death in 1973 was attributed to prostate cancer. Now, 42 years later, the Chilean government says the Nobel laureate may have been killed in the aftermath of a coup. 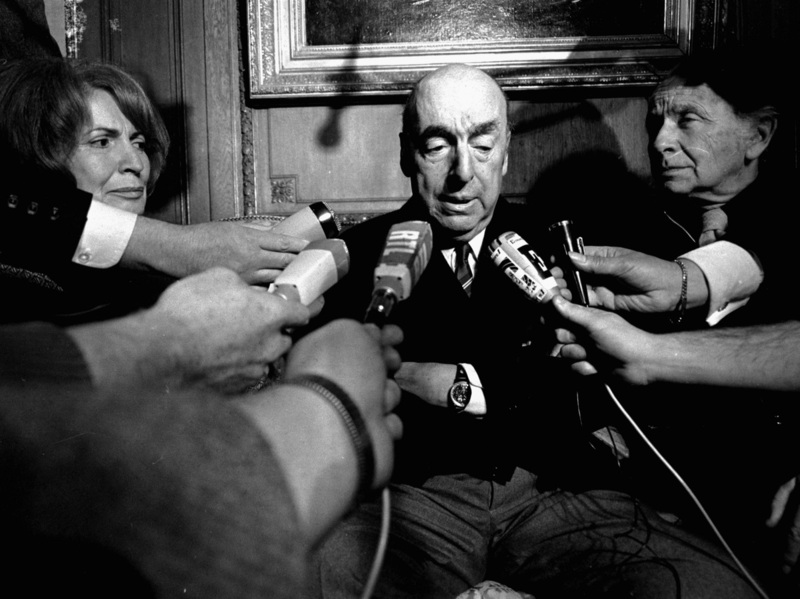 Poet Pablo Neruda talks with reporters Oct. 21, 1971, in Paris after being awarded that year's Nobel Prize for Literature. The Chilean government has acknowledged that Nobel Prize-winning poet Pablo Neruda might have been killed during the aftermath of the 1973 coup that brought Gen. Augusto Pinochet to power. The announcement from the country's Interior Ministry came after the Spanish-language newspaper El Pais reported that a government document dated March 2015 said it was "highly likely" that a third party was involved in Neruda's death. The government statement acknowledged the document and said the investigation into the cause of Neruda's death would continue. Chile had previously maintained that Neruda died of prostate cancer, as the Two-Way reported in 2013.